Jonny Quest in "20,000 Leagues Under the Sea"
Gary Karpinski provided much of the following information (as well as these images of the LP's front and back covers) based on his copy of the LP; I've added some additional information based on additional research. As with the "Favorite Songs of Jonny Quest" 45 pictured below, there was a promotional copy of this LP. Album is 28 minutes in length (14 minutes each side). Gary writes: "Not even half as good as the Cartoon intro music. Sounds a little bit like "James Bond" music. I said a little bit!" After listening to a copy of this album, I must agree - this "jazzed-up" version of the familiar theme misses the mark. Jonny Quest - Tim Mathieson. Gary writes:"Tim's voice had definitely changed when they recorded this 1965 album. It's a lot lower sounding than his JQ cartoon voice." Further research reveals that the record was indeed made after the series, in 1965, which explains Jonny's lower voice. And speaking of name changes -- I'd been aware that Matthieson (from the TV credits) eventually became Matheson, but the Mathieson seen on the LP's cover is probably just a typographical error. Based on the Jules Verne Classic "20,000 Leagues Under The Sea"
Additional note from Gary: "Like I said before, the intro and end "Jonny Quest" song is different from the cartoon version,but during the story you can hear some of the familiar classic JQ music from the cartoon." Gary was kind enough to send a copy of this audio presentation, and I was quite surprised to discover that the "story" was actually a new Jonny Quest adventure! The intro made mention of the fact that Jonny was reading Verne's classic tale, and was very excited by the story of the giant squid, etc., but the rest of the story tells how Jonny, Dr. Quest, and Race get a call from a government official about a sub that went down in deep waters not too far from where they were testing Dr. Quest's diving bell. During the course of their subsequent search for the sub, they... well, let's just say it would've made a good TV episode, with science and mystery and excitement and danger! Here's a transcript of part 1 of the story on the LP. And here's part 2 of the story transcript. And finally, here's a transcript of the 45 RPM version. Thanks to "inachan2" for providing the original text for these transcripts! And thanks to Mark Meschino who sent in the following MP3 files for the tracks on the LP! A short version of the 20,000 Leagues story was presented on a 45 rpm record featuring the same cover art. The "Favorite Songs Of Jonny Quest" cover lists the following 5 songs: Top Cat, Smokey the Dragon, Bed Rock Rock, Robin Hood, Jonny Quest. Having said that, the actual contents of the 45 inside are: Top Cat, Augie Doggie, Bed Rock Rock, and Jonny Quest! I have no clue as to why there's such a big discrepancy. 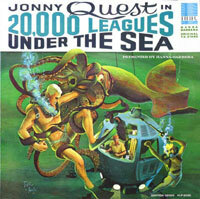 The Jonny Quest song is the same "jazzy" version that apears on the "20,000 Leagues Under the Sea" LP, as discussed above. Thanks to "inachan2" for the above information!